Last week my company bought for me a new Dell Instpiron 14-z. The PC being an i3 with 6GB RAM and 500 hard disk space, It was good substitute for my antique core 2 duo Inspiron 1520 laptop. Dell Inspiron 14-z 5423One thing i disliked though was that the machine was not pre-installed with Ubuntu. However i played with the existing OS, Windows 8 and every action i performed on my machine had an instant response. It is a good machine with good specs. As usual the OS came with existing Dell and Microsoft software’s i liked. Back up and Power Management softwares. As a fun of games, i quickly installed FIFA 13 to check on its performance. I turned on every advanced hardware intensive feature of the game such as Video display and still the machine was working as if it was not going to boot again. Well, I then decided to do the deed, Dual booting. Dual booting means having more than one operating system on your machine to boot from. The Inspiron 14-z came with windows 8 pre installed to boot using Unified Extensible Firmware Interface( UEFI). One advantage that i know of and i have liked about UEFI is the ability to have as many primary partitions as you wish. For those who dont know, UEFI is a new tech that is slowly replacing Basic Input/Output System (BIOS). This is to show you that what you studied at school is soon going in the archive. UEFI is super but in the world of linux, fire catches slowly with new stuff. Technology is adopted slowly however this has improved over time. And it is continuing to improve. If you don’t think so, Dell laptops now come pre installed with Ubuntu. I followed all the options available to install Ubuntu to boot from UEFI but all in vain. I even followed Canonical’s. pointers and ended on the GRand Unified Bootloader (GRUB) Commandline (CLI). I could not install Ubuntu on UEFI. Using the pointers given to me from canonical i disabled secure boot, disabled intels Smart Response Technology (SRT), disabled UEFI and quick boot but no change. 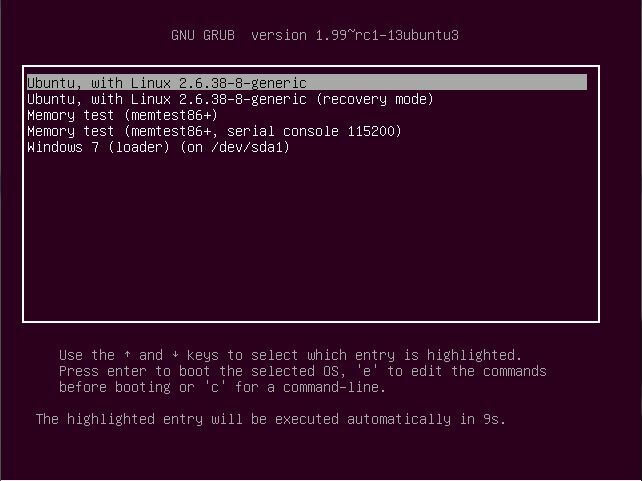 However, i was able to get a clean GRUB UI but with not option to create partitions coz the disk was using Guid Partision Table ( GPT ). I could not even see that windows was installed but rather a disguise of a raw disk. I was scared and so i booted to windows. I used a third party software from partition wizard and created linux file systems for ubuntu installation but this did not help me either because the partition table was still in GPT . Yeah UEFI uses GPT system and not the old school Master Boot Record (MBR)system. Yeah, i was now so frustrated and only God knows. I read articles that indicated that Microsoft from Redmond was doing this to hurt people who want to dual boot on machines pre installed with Microsoft’s Windows OS. Other blogs even indicated that installing Ubuntu using UEFI was the only option. Others suggested even buying PCs that are pre-installed with Ubuntu. Well with all these frustrations, it was time to make a bold move and take the risk. I was ready to reap my hard disk apart. All the partitions that were marked as reserved and OEM, were the ones scaring me. I was scared of deleting the partitions and then lose the hard disk firmware drivers. However i had to do this wisely. 2) I got a fresh installation of windows 8 and used the installation to create the windows version of MBR partion table. This means i deleted everything on machine. Even the wonderful softwares that came with my machine were all gone . I used the new installed windows OS and the partion wizard software to create linux partions. The result was still bad. Not only could Ubuntu not see the new NTFS partitions but it could not see even the EXT4 partitions i created using MBR partition table from windows. More hate for Microsoft. 3) My face was like a 90 year old and it was time to do the ultimate sacrifice. I boot from Ubuntu’s live disk and used Gparted partion manager to delete the current partion table and a created a MBR that supports MSDOS (Windows). I created windows NTFS partitions and also linux EXT4 partitions. I commited the changes and then rebooted the machine with a windows installation disk. Windows 8 detected everything and the installation worked. After that i also installed Ubuntu 13.04 and the installation worked like charm . Please make sure that when you are using GParted you create windows primary NTFS and other partitions first . You have upto a maximum of four primary partitions to create. I am not responsible for anything if you reap your stuff. Previous articleWhy Test your code?